Elementary art teacher Maggie Parks talks to the board at the start of the May 18 meeting. Also pictured are students, from left, Javi Nunez, Elias Ruiz and Oscar Waterhouse. Elementary art teacher Maggie Parks talked about the “Trophy of Learning” art projects at Woodbury and Fisher elementary schools. 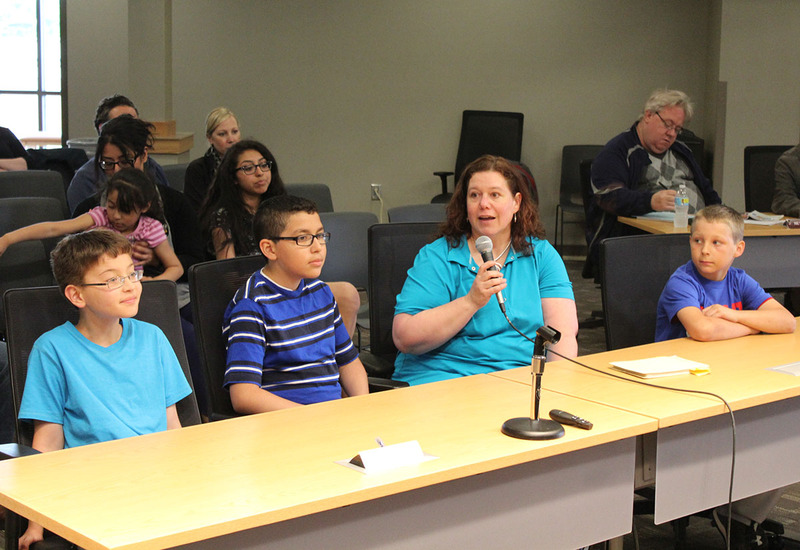 Also talking to the board about the projects were students Javi Nunez, Elias Ruiz and Oscar Waterhouse. The sculptures used clay pieces made by the students and were put together by student teacher Tilly Woodward. Kevin Posekany presented the audit bid for 2015-17. The board approve bids from Nolte, Cornman & Johnson of Newton of $14,250 for 2015, $14,750 for 2016 and $15,250 for 2017. Lynn Large, said MCSD has decided to participate in the Community Eligibility Provision. All students at all six elementary schools in the district will receive breakfast and lunch at no charge next school year as part of this program. “This is a really exciting provision for us as it makes access to meals easier for our families that we serve,” Large said. The board approved the district-wide preschool playground project as substantially complete. MHS west administration addition and district vestibule project. Bids were received on May 14. The results of the bids were not as expected as the two bids received were well over the architect’s estimate. The district plans to disconnect the security vestibules from the main MHS project in hopes to get more favorable bids. The board accepted the recommendation to reject the bids. The district will revise the project and bring it back to the board. A public hearing was held for this project for work at Hoglan Elementary School. There are physical safety concerns with storm and refreeze – due to water runoff from the roof at Hoglan. The project was let out to bid with bids to be received on June 11 and the possible awarding of bids on June 15. The board accepted the plans, scope of work, schedule, form of contract and anticipated budget for the project. 705.9 – Death of a Student, Staff Member or Board Director – Remove last three lines of policy and bring back. The next regular board meeting is at 5 p.m. June 1 in district offices. 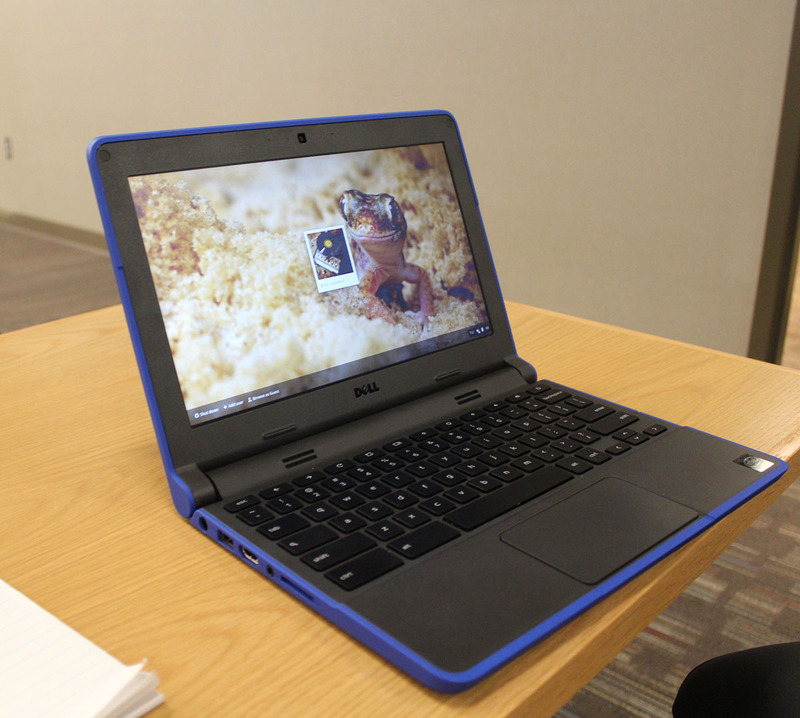 Pictured is an example of the type of Dell Chromebook that will be offered to students as an individual device at Marshalltown High School this fall. Jeff Weinberg, Dr. Susan Pecinovsky, Kyle Young, Pam Brewer-Michael and Jacy Large presented to the board a progress report on the Digital Conversion. The next wave in the Digital Conversion will see the district purchase 1,190 Dell Chromebooks as part of a 1:1 effort (individual student devices) at Marshalltown High School. “Chromebooks have really hit their stride in the educational market,” Weinberg said. The estimated cost per unit is $290. Two funding streams to support this are textbook adoptions funds and computer replacement funds. Young said teachers have thanked him at Lenihan Intermediate School, saying the Chromebooks are such an integral part of their classroom. “They are pretty widely used,” Young said. This was a non-action item on the agenda as they will now go out to bid. Lenihan Intermediate School teacher Paul Sibbel talked to the board about the use of iPads in music instruction. 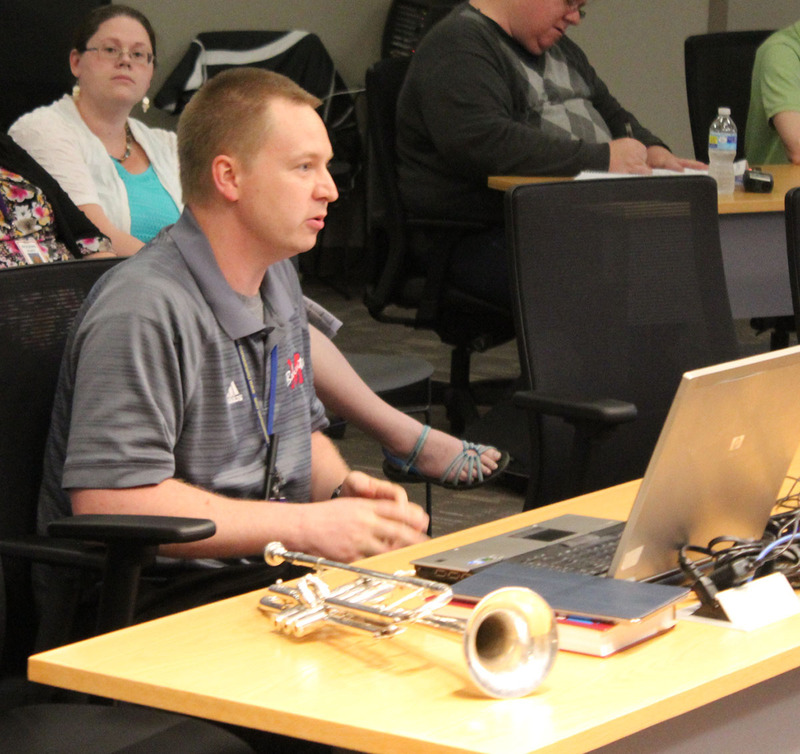 Paul Sibbel, Lenihan instrumental music instructor, gave a demonstration on the use of iPads in instruction, especially as a tool for evaluating his students. The board approved the bid for 48 Apple iPad Air2 64GB from Apple Inc. for $27,592. A Martha-Ellen Tye Foundation grant will pay 50 percent of the cost and the district will pay the other 50 percent of the cost. Dr. Mick Jurgensen presented the annual attendance center plan for Rogers Elementary School. The school recently completed an IPI assessment on student engagement that showed Rogers met or exceeded numbers that are in line with effective schools. “We are doing pretty well,” Jurgensen said. Jurgensen presented results of this year’s Iowa Assessment in reading and math. Jurgensen said he was pleased with the work staff has done on student attendance rates. They have reduced the percentage of chronically absent students each year for the past five years at the school. The summer learning program Rogers University will enter the fifth year of a five-year grant this summer. Jurgensen said they are looking into other sources of funding to keep the program going in future years. Pecinovsky presented the 53 teacher leadership positions for this fall as part of the TLC system. The board approved the list. To view the list, click here. Lisa Koester presented handbooks for the elementary schools, Lenihan Intermediate School and Marshalltown High School to the board of approval for the 2015-16 school year. Also presenting for the elementary were Anel Garza from Woodbury, Mick Jurgensen from Rogers and Ronnie Manis from Anson. Kyle Young and Liz Jurgensen presented with Mrs. Koester on the Lenihan handbook. Some minor changes were requested by the board and the handbooks for the elementary schools and Lenihan were approved. Ken Hayes from MHS assisted with the high school handbook presentation. Hayes said they are not going to print the high school handbook for all students for next school year, but they will be put on the website and paper copies will be available at the high school office and library upon request. The MHS handbook was approved with minor changes by the board. Eric Goslinga from Marshalltown Learning Academy presented the handbook for MLA, which is new to the school. Mr. Goslinga will come back to the board on May 18 to talk more about MLA. The board approved the handbook, minus the section of the dress code, which will come back to the board at a later date for approval. The board approved the creation of the Johnson-Engel Scholarship Endowment in Engineering. This scholarship will be for MHS students heading to Iowa State University and was created by MHS graduates Dale and Janice Johnson. The board also approved the contributed funds from anonymous MHS graduates who want to create a STEM camp for elementary students to attend. 905.9- Smoking in the School District facilities- Changed to say use of tobacco prohibited on all school property Change title to “Smoking and Tobacco Use On School District Facilities” Will be brought back to board for approval. 705.9 – Death of a Student, Staff Member or Board Director (new policy) – Strike last three sentences and be brought back to board.